Given the data, activation of JNK and NF-κB suggests that signaling associated with inflammation occurs when the cells are exposed to E-cigarette vapor. ERK had a relatively short period of activation, implying less intense signaling. It can be deduced from the data that JNK's prolonged activation implies more intense signaling. The data indicates that p38 has a prolonged level of activation and, accordingly, more intense signaling. Therefore, as indicated by the results, nicotine enhances the activation of the aforementioned MAP kinases. Figure 7. Western blots of targets. Cigarette smoke activates MAP kinases (Mercer & D'Armiento , 2006, p. 137-150). This study was proposed to detennine whether nicotine alone could activate these MAP kinases as well. The data show that E-liquid containing nicotine activates ERK, JNK, and p38 MAP kinases. The next step would be to repeat the experiment to substantiate the results as well as to determine whether the protein's level of activation is greater when treated with E-liquid containing nicotine, E-liquid without nicotine, or nicotine alone. Greater activation may imply greater inflammation and protease activity. Additionally, studies in animals would further enhance the results established in this study and suggest the potential human implications of using E-cigarettes. Figure 8. Semi-quantitative analysis of Western blots using the ratio of total protein to actin. PBS is used as a control. 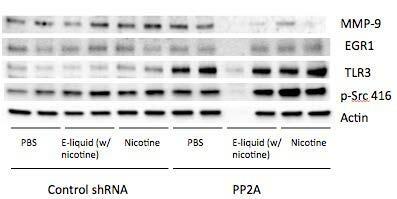 Silencing PP2A produces (a) less of the protein MMP-9, (b) a 25% increase in protein levels from PBS to E-liquid with nicotine (statistically significant; p < 0.05), (c) an increase in TLR3 protein levels. and (d) an increase in p-Src 416. Figure 9. The amount of DNA binding detected during the transcription factor assay was proportional to the activity of NF-κB and AP-1. In graph (a), a significant difference (p < 0.05) suggests that NF-κB was activated. MMP-9 is a protease (Foronjy et al., 2008, p. 1149-57). As mentioned before, proteases play a key role in the development of COPD ("Protease", 2013). MMP-9 levels were unaltered by E-liquid in this study. However, the extracellular levels and activity of this important protease were not determined. Despite not identifying a change in intracellular MMP-9, this mechanism cannot be fully eliminated because MMP-9 gene expression and protease activity must be fully investigated to draw a conclusion. The data also indicate that when cells are treated with concentrated E-liquid, NF-κB is activated. When cells are treated with cigarette smoke, MMP-9 gene expression and levels increase and ultimately contribute to the development of emphysema (Thorley & Tetley, 2007, p. 409428). Dr. Foronjy (unpublished data) recently found that when primary lung epithelial cells are treated with E-liquid, cytokine and protease gene expression (e.g. MMP-7, MMP-9, Cathepsin Lt, TLR3, and c-Src) rises. This study hypothesizes that when cells are treated with 1% E-liquid, MMP-9 levels increase. The cells utilized in this study are not a primary cell line and expression of MMP-9 may not be the same as primary cells. Nevertheless, the results of either study must be verified through repeated experimentation and clinical samples. When cells are exposed to cigarette smoke extract, ERK, JNK, or p38 is silenced and MMP9 levels drop (Mehra et al., 2012). In future experiments ERK, p38, and JNK could be knocked down using siRNAs, and MMP-9, EGRt, TLR3, and p-Src 416 levels could be analyzed. These experiments could determine whether the aforementioned MAP kinases are integral to protein synthesis. Cigarette smoke induces cells to produce more proteases and inflammatory signaling (Mercer & D'Armiento, 2006, p. 137-150). Future studies ought to attempt to show whether E-liquid induces cells to produce more proteases and inflammatory signaling such as Cathepsin Lt, MMP-7, TLR3, and c-Src. This study determined that the use of nicotine delivery via E-cigarettes may impact lung inflammation and consequently lead to disease initiation and progression. A substantially similar version of this article previously appeared in Student Pulse (2015) Vol. 07 No. 05. That article is available here: Are E-Cigarettes a Safe Alternative to Smoking? First and foremost, I would like to thank Dr. Foronjy for his time and enthusiasm in supervising this project. Moreover, I thank Dr. Geraghty and Dr. Turino for their guidance and encouragement. Finally, I want to thank my family for their unconditional love and support. "Chronic Obstructive Pulmonary Disease (COPD)." World Health Organization. N.p., n.d. .16 Nov. 2012. Foronjy R., Nkyimbeng T., Wallace A., Thankachen J., Okada, Y., Lemaitre V., D'Armiento J. (2008). Transgenic expression of matrix metalloproteinase-9 causes adult-onset emphysema in mice associated with the loss of alveolar elastin. Am J Physiol Lung Cell Mol Physio. 294(6),L1149-57. doi: 10.1152/ajplung.00481.2007. Epub 2008 Apr 11. Goniewicz M.L., Knysak.J., Gawron M., Kosmider, L., Sobczak A, Kurek, J., ... Benowitz, N. (2013). Levels of selected carcinogens and toxicants in vapour from electronic cigarettes. Tob Control. Jha P., Chaloupka F.J., Moore J., Gajalakshmi V., Gupta P.C., Peck, R., ... Musgrove P. Tobacco Addiction. Jamison DT, Breman JG, Measham AR, et al., editors. Disease Control Priorities in Developing Countries. 2nd edition. Washington (DC): World Bank; 2006. Chapter 46. Jiang B., Xu S., Hou X., Pimentel D.R., Brecher P., Cohen R.A. (2004). Temporal control of NF-κB activation by ERK differentially regulates interleukin-lbeta-induced gene expression. J Biol. Chem. Jan 9;279(2),1323-9. 2003 Oct 27. Lerner C.A., Sundar I.K., Yao H., Gerloff J., Ossip D.J., McIntosh S., Robinson R., Rahman I. (2015) Vapors produced by electronic cigarettes and e-juices with flavorings induce toxicity, oxidative stress, and inflammatory response in lung epithelial cells and in mouse lung. PloS One. 10: e0116732. Lee H.S., Moon C., Lee H.W., Park E.M., Cho M.S., Kang J.L. Src tyrosine kinases mediate activations of NF-κB and integrin signal during lipopolysaccharide-induced acute lung injury. J Immunol 2007 Nov 15,179(10),7001-11. Mercer, B.A., & D'Armiento, J.M. (2006). Emerging role of MAP kinase pathways as therapeutic targets in COPD. International Journal of Chronic Obstructive Pulmonary Disease, 1(2), 137-150. Mehra D., Geraghty P.M., Hardigan AA, Foronjy R. (2012). A comparison of the inflammatory and proteolytic effects of dung biomass and cigarette smoke exposure in the lung. PLoS One. 7(12),e52889. doi: 10.1371/journal.pone.0052889. Moodie F.M., Marwick J.A, Anderson C.S., Szulakowski P., Biswas S.K., Bauter M.R., ... Rahman I. (2004). Oxidative stress and cigarette smoke alter chromatin remodeling but differentially regulate NF-κB activation and proinflammatory cytokine release in alveolar epithelial cells. Faseb J.18,1897-9. Pahl, H.L. (1999). Activation and target genes of Rel/NF-κB transcription factors. Oncogene, 18(49), 6853-66. Parra E., Ferreira J., Ortega A. Overexpression of EGR-1 modulates the activity of NF-κB and AP-1 in prostate carcinoma PC-3 and LNCaP cell lines. Int J Oncol. 2011 Aug;39(2), 345-52. doi: 10.3892/ijo.2011.1047. Epub 2011 May 20. Pellegrino R.M., Tinghino B., Mangiaracina G., Marani A., Vitali M., Protano C., Osborn J.F., Cattaruzza M.S. (2012). Electronic cigarettes: An evaluation of exposure to chemicals and fine particulate matter (pm). Annali di igiene : medicina preventive e di comunita 24, 279-288. Reynolds P.R., Cosio M.G., Hoidal J.R.(2006). Cigarette smoke-induced Egr-1 upregulates proinflammatory cytokines in pulmonary epithelial cells. Am J Respir Cell _ Mol Biol 35(3),314-9. Epub 2006 Apr 6. Sussan T.E., Gajghate S., Thimmulappa R.K., Ma, J., Kim, J.H, Sudini, K., ... Biswal, S. (2015). Exposure to electronic cigarettes impairs pulmonary anti-bacterial and anti-viral defenses in a mouse model. PloS One. 10: e0116861. Thorley, AJ., &. Tetley, T.D. (2007). Pulmonary epithelium, cigarette smoke, and chronic obstructive pulmonary disease. International. Journal of Chronic Obstructive Pulmonary Disease, 2(4), 409-428. Wallace AM., Hardigan A., Geraghty P., Salim S., Gaffney A, Thankachen J., ... Foronjy R.F. (2012). Protein phosphatase 2A regulates innate immune and proteolytic responses to cigarette smoke exposure in the lung. Toxicol Sci. 126(2):58999. doi: 10.1093/toxsci/kfr351. Epub 2012 Jan 5. "What is COPD?" National Heart Lung and Blood Institute. U.S. Department of Health & Human Services, n.d. Web. 16 Nov. 2012.